For an added bonus you can smoke the salmon! Split your bagel down the middle and toast until crispy. Meanwhile, crack your eggs into a small bowl, add salt and pepper and whisk vigorously. Heat a small nonstick frying pan over medium heat, add your butter and allow it to melt. Pour your whisked eggs into the buttered frypan and stir continuously until the eggs have cooked through but are still soft. Add in the dill and set aside. 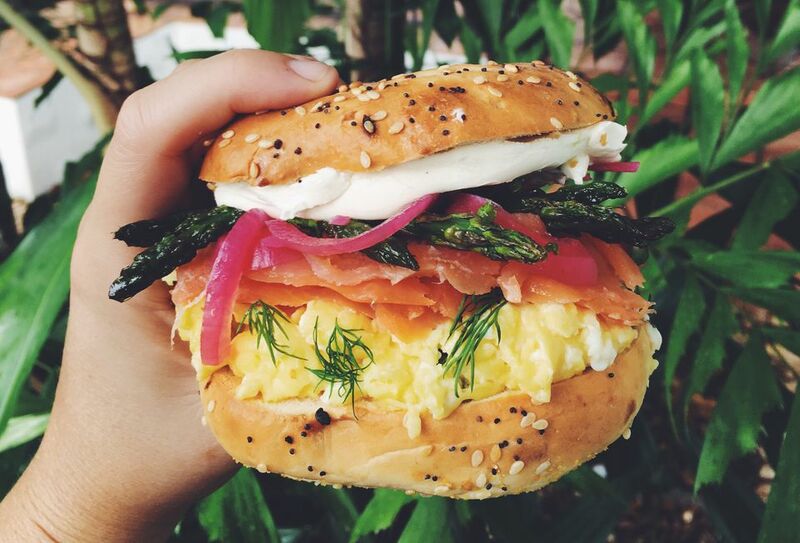 Once the bagel is toasted, gently place the soft scrambled eggs on top of the bottom half of the bagel, then add the smoked salmon pieces, the cooked asparagus, and the pickled red onions. Next, take the remaining top half of the bagel and smear it with cream cheese. Place the creamed cheese bagel half on top of the rest of the sandwich and serve.